Andhra Pradesh Chief Minister Chandrababu Naidu said the Centre was targeting his state leaders. 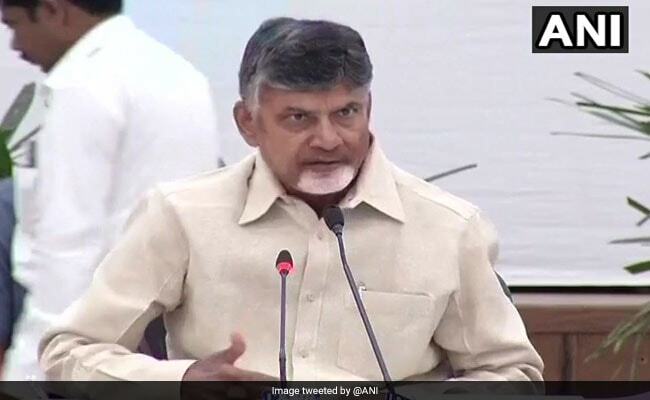 The BJP says Mr Naidu's remarks are "ludicrous"
Accusing the central government of conspiring to "finish off" the state, Andhra Pradesh Chief Minister N Chandrababu Naidu on Friday said, the BJP will pay a "heavy price" if it did not stop targeting his state leaders with tax raids and "whipping up sentiments" against his government. Mr Naidu was addressing a two-day conference of district collectors in Amaravati. "... What does the NDA government have against me? Personal vengeance... as I did not surrender to them...they are going to pay heavy price for all these things. As individuals, as government they are going to pay a heavy price," Mr Naidu said. Referring to the recent row over ornaments at the Tirumala Venkateswara temple, the Chief Minister alleged that the Centre was trying to defame his government. "Their effort was to tarnish our image, whip up sentiments in public so that Hindus turn against this government. Is it right?" he asked his administrative officers present at the conference. The BJP and Mr Naidu had earlier locked horns over the 'missing' jewels at the Tirupati temple when the Chief Minister called the entire episode fabricated. Mr Naidu said, "Two commissions had verified everything but now these people (BJP) are saying that the gold and the diamonds are missing." Alleging conspiracy, he said, the BJP wanted to take over Tirumala administration, to protect the monument, but who are they? It belongs to the Andhra Pradesh, and it is being managed well." The BJP called Mr Naidu's remarks "ludicrous" and said it exposed his "rabid paranoia". "The TDP government is facing a severe backlash from people and experiencing their wrath for running an unpopular and rottenly corrupt government. This seems to have taken a toll on the psychological condition of the Chief Minister. The ludicrous comments indicate that Mr Naidu is exhibiting signs of rabid paranoia and schizophrenia," lashed out BJP Rajya Sabha lawmaker, GVL Narasimha Rao, in a statement. Without taking names, Mr Naidu warned his officers to be alert as "goondas" may try to break law and order in Andhra Pradesh. "Don't be afraid or become panicky," Mr Naidu told his top IAS and IPS officers and asked them to be "mentally prepared" of more attacks in the future. "Anti-social elements will rise if erratic rulers assume power and such rulers will do things detrimental to public interest. In the country now, CBI is finished, ED is finished. Income Tax Department is gone. If at all, only the Supreme Court should protect us. We have come to that stage," added the Chief Minister.